I'm always ready for an excellent bookish discussion, and Raincoast Books has always been prepared to deliver! 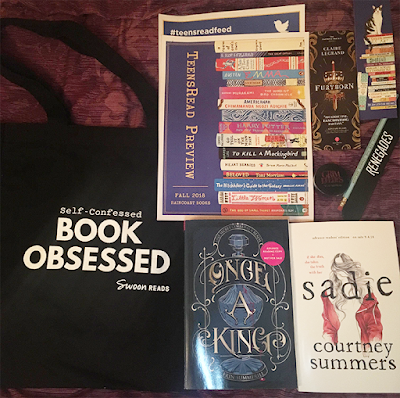 The latest TeensRead Preview took place on June 2nd, and focused mainly on upcoming fall titles with plenty of buzz. 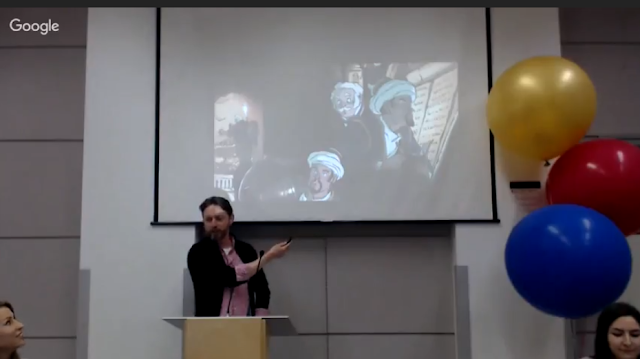 Unfortunately, I wasn't available to attend in person, but I did attend virtually through the Google Hangout. As I hunkered down, eager for the preview with WordPad wide open, I wondered to myself, "How many titles would wander their way onto my TBR list this time around?" The answer - almost every single one...I'm not even kidding! As the presentation started, I found myself discovering several titles I'd only briefly learned of before, but also came across several new ones that sounded very exciting! 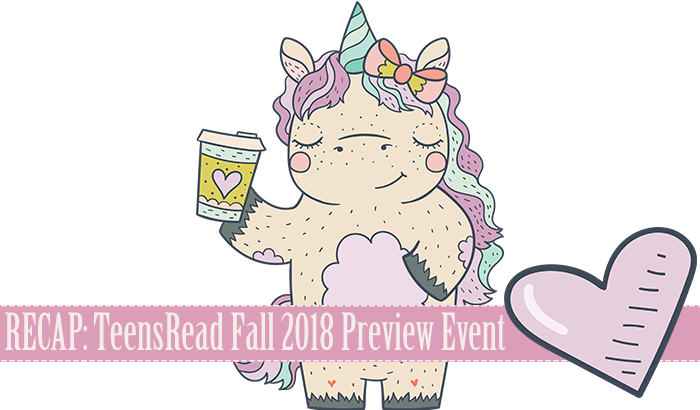 Below you will find a detailed list of all the titles that were discussed during this year's Fall TeensRead preview, in addition to my own commentary on upcoming titles. Furthermore, you will also find a heart (💓) emoji next to titles that have made their way onto my reading wish list and a maple leaf (🍁) emoji for titles written by Canadian authors. A title that immediately caught my attention. It was blurbed as a title perfect for fans of speculative fiction. Described as The Black Swan meets Paranormal Activity, this one is a sure-win on my TBR list! Mirage is the first in a brand new trilogy and a debut by author Somaiya Daub. It was blurbed as being perfect for fans of smart epic fantasies and The Red Queen. Latest by the Canadian author, well known for her incredible titles. Sadie is an epic thriller and page turner that is perfect for true crime fans looking for their next fix! Not Even Bones is the first in a brand new YA trilogy by Canadian author Rebecca Schaeffer. This compelling dark fantasy title is pitched as Dexter meets The Savage Song. Exciting! Described as THE ULTIMATE BOOK for book lovers. It's an illustrated guide/reference title that brings not only literary people but also fictional settings to life in a curated bind-up. Dare You to Lie is the first YA title from Best Selling Canadian author Amber Lynn Natusch. The suspense/thriller features an edgy prose and sassy protagonist. A brand new bind up featuring the first half of the insanely popular web comic of the same name. The beautifully illustrated title features a coming of age story about friendship and growth. Unbroken is a brand new anthology featuring pieces from countless well known authors. The title's tales focuses on stories told through the perspectives of characters with disabilities. A brand new graphic novel that tackles the difficult subject matter on the endless turmoil present for the refuges of Syria. Important subjects like survival and immigration are discussed in The Unwanted, giving readers a realistic perspective on the subject matter. Pitched as Alice in Wonderland set in real world Atlanta. A trippy fantasy with the cast of Alice in Wonderland in a way we've never read before. An interesting title that immediately captured my attention. After the Fire is a thriller that focuses on the gripping account of a teenage girl in a dying cult. 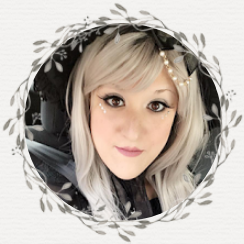 A new YA fantasy title with monsters. It promises plenty of action for readers and features an assassin-like prose. A graphic novel set in a made up world filled with crumbling skyscrapers and buildings. It also features an interesting mystery surrounding the protagonist and has many leaps between time. A grim brothers fairy tale with a twist. Perfect for fans of mysterious fantasies with a wickedly delicious twist. I'm very eager for this one! Short informative bios about strong influential women who changed the world. Also includes less known historical female figures, and an interesting look at their lives and accomplishments. Inspiring and visually beautiful. A larger in depth look at influential women who changed the world. A series of essays and passages that focus on the truth behind these incredible and strong women. A beautifully written contemporary romance. Described as a fairy tale with a modern twist. Sign me up! An epic fantasy, first in a new YA trilogy, that focuses on haunted pasts and cultural differences. I'm highly interested in checking out Black Wings Beating! The latest installment in the Throne of Glass series. Promises to be an epic and heart stopping conclusion to the series. I'm sad to see this series end, but I'm very eager to see what Sarah. J. Maas has in store for her readers! The Darkest Star is set in Jennifer L. Armentrout's world in the Lux series. Being a huge fan of JLA and all her titles, and having LOVED her Lux series, I'm very eager to see what she has in store for her fans in this brand new origin series. A book pitched as Stranger Things meets Pirates of the Caribbean. Features a story with plenty of action and an interesting mystery. The next installment in the Renegades series. I'm so over the moon and excited for this installment. Renegades completely blew my mind! A title boasting a deadly competition to become the next empress. Has a promising protagonist and a twist of Japanese folklore - loveeeeeee it! A brand new title with plenty of suspense, told in dual perspectives. Authors responding to real letters from teens all over the world. Subject matter includes love, dating violence, loneliness, betrayal, cheating, and more. Very interested in checking this one out! I was very excited to hear that Tony Cliff, the author behind the Delilah Dirk series, would be the special guest for this year's Fall TeensRead Preview. Having been recommended the series through Amanda of Brains, Books and Brawn, I was very eager to hear him introduce his latest installment in the series, Delilah Dirk and the Pillars of Hercules, and maybe get some better insight on what to expect in his titles. Tony immediately dove into discussing his inspiration for Delilah Dirk, mentioning that he was inspired by the idea of creating something he personally wanted to read or watch. He further discussed his writing and drawing process, focusing on organizing and planning panels in ways that would surprise his readers. I was extremely drawn in by his presentation, and certainly can't wait to check out the Delilah Dirk series for myself! Immediately following Tony Cliff's enlightening presentation, we were all given the opportunity to discuss among ourselves (in person or via Google Hangout) on what titles stood out to us and why. I had several titles stand out for me, including The Dark Beneath the Ice, The Grim Lovelies, Mirage, Unbroken, and Sadie. Overall, I came away with a far longer reading list than I originally had before the preview. I was pleased to see that there would be several titles that will be hitting shelves later this year that are exactly what I enjoy reading. 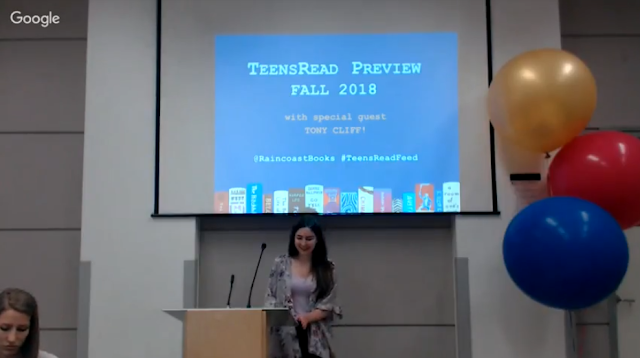 I want to extend a huge thank you to the wonderful team of Raincoast Books for organizing yet another informative and fun TeensRead Preview event! I positively can't wait to dive into many of my favorites soon, and look forward to sharing my thoughts with everyone.